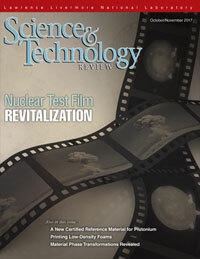 Scientists digitize and analyze mid-20th century atmospheric nuclear test films in support of stockpile stewardship and nuclear weapons science. A 25-year effort to certify a plutonium reference material is nearing completion, and the result will strengthen safeguards worldwide. Livermore researchers use an innovative three-dimensional printing technique to fabricate specialized foams for a range of applications. Livermore researchers are revealing new physics of material phase transitions by shocking matter at extreme conditions.